The UBC Sustainability Initiative (USI) is dedicated to increasing student exposure and education in the field of Sustainability. UBC’s ultimate goal is that every student has access to, and hopefully pursues, a sustainability learning pathway alongside their disciplinary education. A “Sustainability Learning Pathway” is a collection of sustainability-oriented courses that students take alongside their disciplinary major. The model currently under discussion in the faculty of Science proposes that a pathway includes the following 5 components: fundamentals course (3 credits), real world experience (0-3 credits), sustainability electives (12 credits), capstone course (6 credits), and a sustainability “learning community” (0 credits). The type of accreditation a student would earn for a pathway will be determined by individual faculties. These pathways are intended to ground students in the four UBC Student Sustainability Attributes: Holism, Sustainability Knowledge, Awareness & Integration, and Action for Positive Change (USI, 2013). A critical step towards achieving this goal is to stimulate student interest in sustainability early in undergraduate programs. 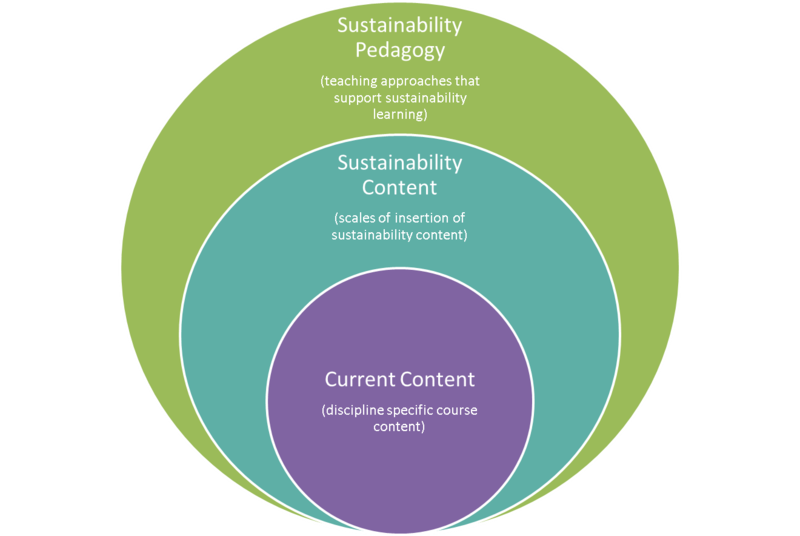 In order to reach students in first year, the USI is encouraging and supporting instructors, departments and faculties to revise a broad spectrum of existing introductory courses by inserting sustainability content and using teaching methods that support sustainability learning (Figure 1). The intent is that these transformed courses will motivate students to enroll in a sustainability learning pathway early in their undergraduate education at UBC. Toward this end, the Sustainability Teaching Fellows of the USI authored a discussion paper entitle “Approaches for Integrating Sustainability into Introductory Courses“ that explored different ways that sustainability could be integrated into large enrollment first year courses. Follow the link above for a pdf version of the discussion paper.